Are you an innovator? Are you thinking about your student as being innovation-ready (versus college-ready)? What must we, as parents, educators, future employers, and community leaders do to enable our young learners to be innovation-ready? 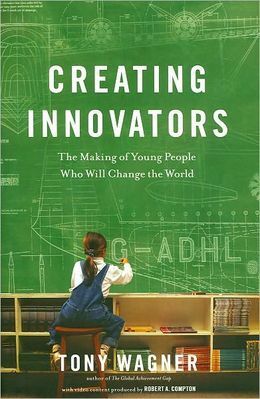 Through the eyes of young innovators themselves and their profound stories (including conversations with their parents, teachers and employers), Dr. Tony Wagner, explores these and many more questions in his groundbreaking book: Creating Innovators…The Making of Young People Who Will Change the World. Dr. Wagner carefully constructs a deeper understanding as to what it means to innovate and how we need to best develop the capacities of students today to become more innovative in what they do throughout their lives. Just to prove his point, Dr. Wagner’s book features its own innovative elements: more than 60 original videos expanding on the key ideas of the book. Produced by filmmaker Robert Compton, the videos are embedded into the eBook edition and accessible in the print edition via QR codes (talk about using my 21st Century devices creatively!). Over the next few weeks, I’m exploring Dr. Wagner’s challenge and call; I’ll share my findings along the way. It’s time we all play our part in creating the transformation to innovation! Are YOU innovation-ready? Note: Please join us tomorrow evening for our innovative C.A.T.C.H. Committee’s annual Family Chili Cookoff Event starting @ 6:00 p.m. This entry was posted in Personal Reflections and tagged innovation, passion, play, purpose, Tony Wagner. Bookmark the permalink. Many thanks for reading and commenting; more to come on this topic soon. These are great questions for everyone to be thinking about.